At Easter, we celebrated Spring and create a Japanese painting inspired by blossom trees. We explored printing techniques and learn how to write in Japanese. Previously we have made boxes treasure boxes about something we love (Valentine’s Day) and at Halloween had a Mexican Day of the Dead theme where we made masks and skeletons. Last summer we did aboriginal art and made canvases. Art Explosion is run by local artists Ruth and Jude, whose interesting art days have become a holiday feature at Penistone Leisure Centre. Art Explosion is £10 for 4hrs. This class is for children aged 6-10yrs and there are a maximum of 20 places. Bring a packed lunch which everyone will eat together. Snacks and drinks will also be for sale in the Leisure Centre tuck shop. To book please contact Ruth on 07970 109161. 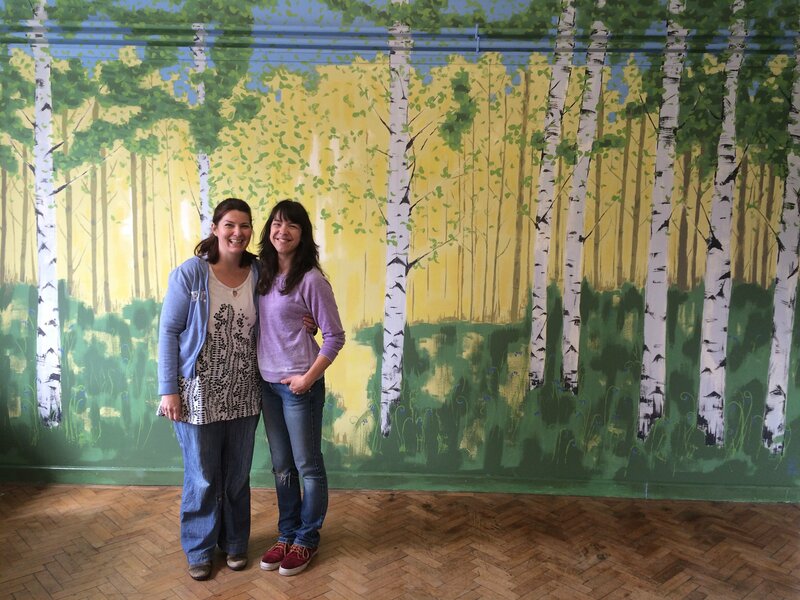 Ruth and Jude painted the beautiful mural in our party room. They are both DBS checked and so you can leave your child at Art Explosion.